Keep your items in place. Before inviting your collaborators to a mural, you can lock elements to the background so that they don't get misplaced accidentally. Right-click on the element and choose "Lock" in the drop down menu. To unlock an element, right click on the element again and choose "Unlock". Multiple select by holding down SHIFT + clicking + dragging over the content. Or, hold down SHIFT + click on each individual. **NOTE: You can also lock or unlock all elements at once to edit bigger projects, like team activity templates, that cover the whole mural. 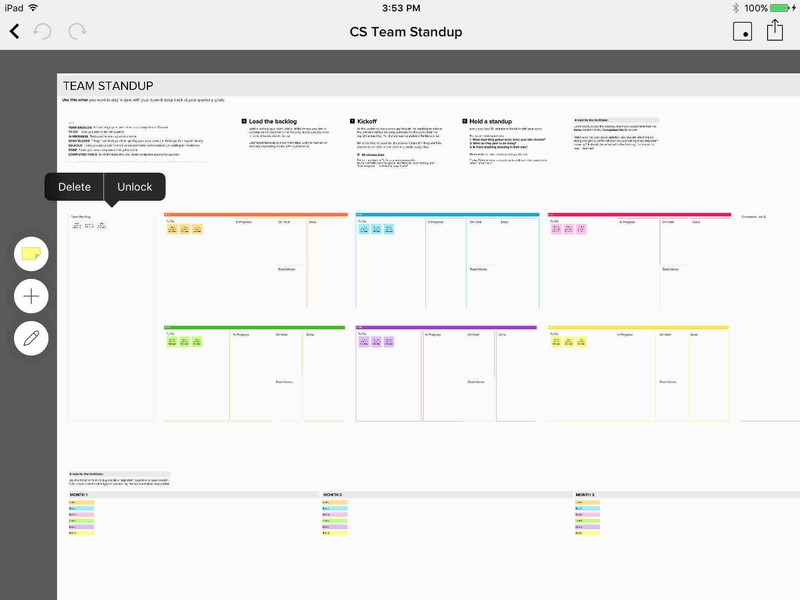 Then you can publish it as a template for your whole team to use! Tap the element and choose 'Lock' from the menu. To unlock an element, tap the element again and choose 'Unlock'. Feel confident that your content will remain undisturbed, staying exactly where and as you originally intended. If you are a Facilitator in a mural, the only users who will be able to unlock what you have locked will be other facilitators.